We like to believe we understand the pillars of biology, even as chemists. In terms of fundamental biology we think of cells, evolution and the discovery of DNA. But as The vital question makes clear in the first page, we do not know why life is the way it is – evolutionary biology is not predictable. Complex life evolved from bacteria over 4 billion years ago, but we don’t know if this was the first attempt at life, or if previous efforts had failed. If you were to look at human and mushroom cells through a microscope, you would have difficulty telling them apart. But why have these cells evolved to be so similar? And there’s the biggest question of all: if life were to evolve on other planets, what would it be like? Nick Lane, a biochemist from University College London, UK, works to uncover what has constrained the evolution of life on Earth and what this could mean in terms of understanding how we got here, as well as how life may potentially evolve elsewhere in the universe. The book has four main sections: the problem, the origin of life, complexity and predictions. Each section builds on the information and theories presented previously, and footnotes and references link you back to relevant topics in other chapters. 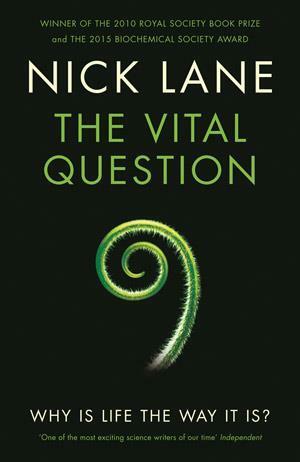 The vital question takes its style from works such as On the origin of species by Charles Darwin, with Lane’s argument based on the hypothesis that evolution and energy are connected. Lane writes in an engaging manner, using plenty of diagrams and micrographs of cells to help make the science relatable. He also refers to ideas that we are more likely to be familiar with, such as the free-radical theory of ageing and the benefits of antioxidants. This has been discussed in numerous newspaper articles and TV documentaries, but by going back to the original science we discover that these views are no longer held by experts in the field. Instead of antioxidant supplements preventing damage by free radicals during ageing, increasing your consumption of them has actually been found to result in premature death, making us rethink what we had previously taken as fact. Despite Lane saying the book is for the general reader, The vital question is not written as a typical popular science book. It is perhaps aimed at an audience engaged with biochemistry research and willing to try and grapple with difficult concepts. There is a brief glossary at the back for those of us whose biochemistry knowledge is slightly rusty, but there are times when you wish a greater selection of terms had been included for easy reference. Overall, The vital question makes for a very thought provoking read that challenges you to understand the numerous complexities of life and how we’ve got here.